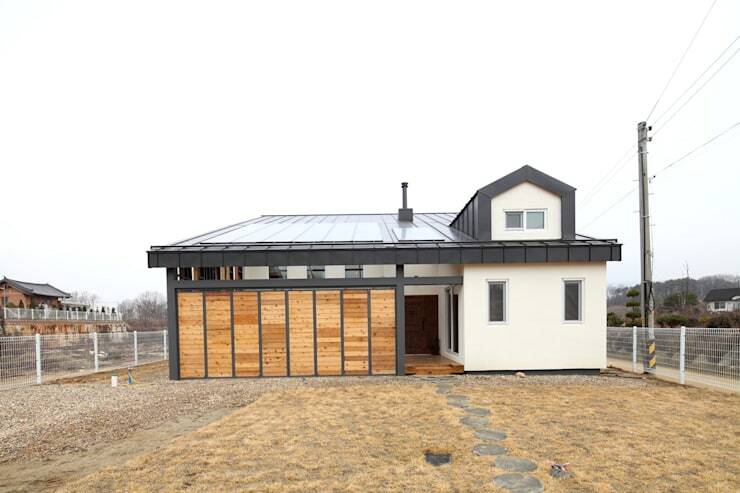 In a quiet and cold neigbourhood in Yangpyeong, South Korea, a couple decided to build a home for their young family to ensure that their children would have everything they need for their academic and physical development. The small neighbourhood offers little tutoring, so the couple decided to create an enriching and creative space for their children at home to learn and grow to their full potential. Pung Gyeong Haim Engineers and Architects decided to undertake the journey with this family in creating a comfortable home that allows children the children to play and learn freely. The architects designed the house on the principle of creating much more space for kids to play in, and ensuring that these spaces are safe and family-oriented. Instead of outsourcing the children's areas to the outdoors, as is often the case with many homes, this particular house includes a place for children in every room, allowing them to feel like a priority. 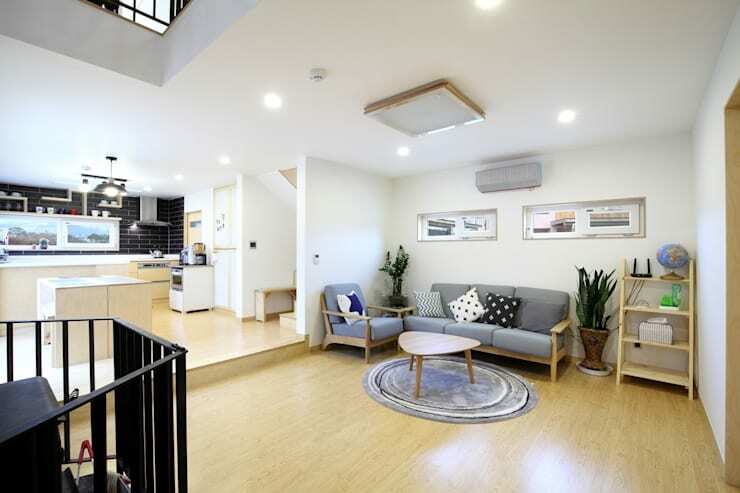 This child-friendly home is situated in the Gyeonggi Province of South Korea, on a property of 384 square meters. Now, the two-storey building only takes up 70 square meters, ensuring that the children of the house have ample outdoor space to run around in, play and learn. The structure is built on a reinforced concrete mat foundation, ensuring stability and durability. A lightweight steel structure was then raised from the ground, around which concrete and wood had been used as the other two primary building materials. With the cold weather in this area, insulation was obviously a priority. In addressing this issue, the architects made use of high density glass wool in the walls and roof. Glass wool is a material made of glass fibers arranged with a binder in a texture similar to wool. This is an excellent insulation material, since it traps pockets of air between the glass fibres, which has very high thermal insulation properties. Let's begin our tour of the home's indoors. Here we can see a neat and compact living room. Nearest to us on the image, we can see the edges of wood-burning stove to warm up the space. How can you spend family time better than gathering everyone around a cosy fire and sharing experiences of the day? What's more, the fireplace is situated under an open area in the second floor, ensuring that the warm air can travel upward to heat the bedrooms on the second floor. The decoration of this space is classic and tasteful, consisting of subtle greys, elegant indoor plants, and trendy Scandinavian style furniture. Here we find the kitchen and dining area, just to the left of the living room we saw before. At the far back we can see black kitchen tiles, offering a pleasant contrast to the light colour of the birch wood used for the floors and finishing. Stainless steel fixtures complement the kitchen, ensuring a modern appearance. 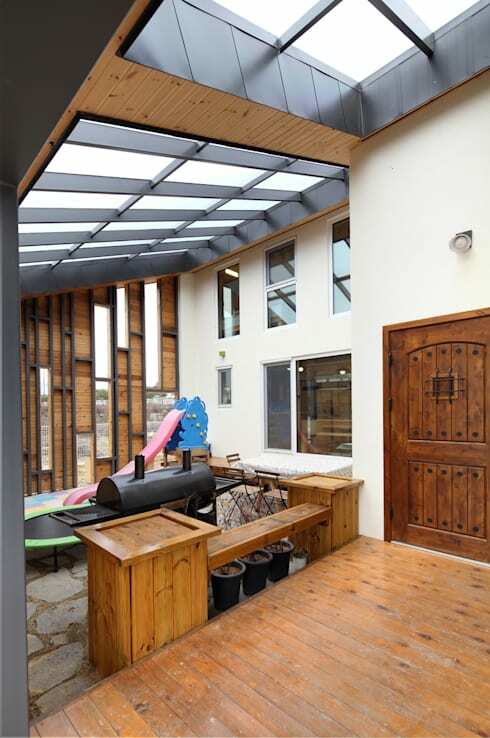 To the left we see large sliding doors which, when opened, allows for the dining area to extend onto the courtyards, where we can also see the children's play area. This is a convenient location, as the children can enjoy themselves on the playground, while mother or father can keep an eye on them whilst cooking or enjoying a cup of coffee in the kitchen. Now to the children's room. As you can imagine, a kid's bedroom should be quite impressive of a child-friendly home, and this one does not disappoint. 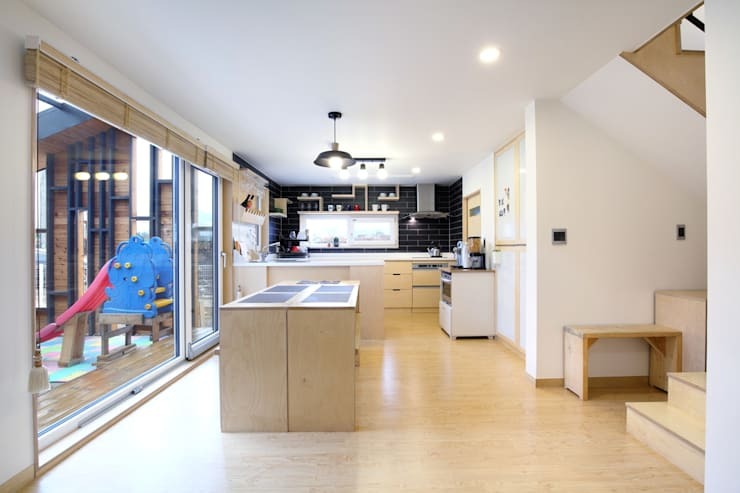 Situated on the top floor of the house, the architects realised that sleep is but a small part of what children will be doing in their room, and decided to maximise this room for activity. This was achieved by inserting a small loft where the beds will be situated, and a large lower area where the kids can do homework or other activities. 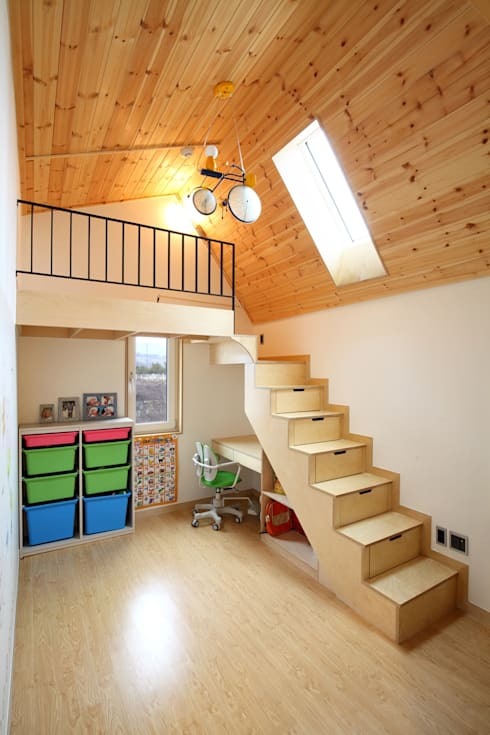 The stairs leading up to the loft contains a storage space in each of the treads, perfect for keeping the multitude of children's toys and belongings. In the corner below the stairs we see a small desk for academic work, surrounded by ample and colourful storage solutions for stationary and art materials. The great benefit of the room is not only the large space it offers for play and crafts, but also its propensity for excellent hiding places in a game of hide-and-seek! If you also want to make your child's living spaces more fun, take a look at these: Cool ideas for a kid's playroom! In this image we can see how the designers aimed to accommodate children in every way possible. 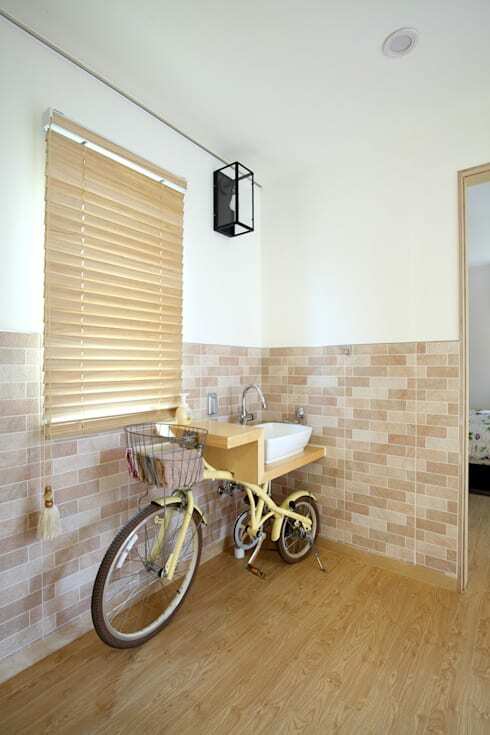 This fixture is found in the entrance hall of the home, and consists of a basin incorporated into an old bicycle. The feature was placed in the entrance hall in order that the children can wash their hands easily after playing outside and before enjoying a meal, and as you can see, the basin is at children's height for ease of access. The bicycle as structure is also a fun design for the kids to enjoy. Although this feature is child-friendly, there is no lack of good style in the space. Beige and sand-coloured tiles are used on the lower half of the wall, and mingles pleasantly with the wooden flooring and bamboo blinds. The neutral environment is a classic staple of good taste. This goes to show that child-friendly spaces do not need to be kitsch or corny. Now to the star feature of the house: the children's playground. This haven is situated on a porch behind the folding, wooden doors we saw in the first image. This allows for the children to get fresh air and spend time outdoors in any kind of weather. At the back, we can see the patterned iron columns of the structure interlaced with wood, but with strategic openings to transform the wall into a jungle gym for the kids. The flooring in the play area consists of large flattened stones surrounded by crushed gravel. This would be an aesthetically pleasing ground covering in any outdoor area, but in the playground it adds another pattern to be exploited by children for their games, often involving jumping from one stone to the next. The facilities include a colourful slide and trampoline, ensuring endless hours of fun and physical activity. There is also a barbeque and oudoor dining table for family lunches on the weekend. If you take your child's development seriously, this is certainly the way to show it! Which room in this child-centred home was your favourite? Do you like the overall vibe? We'd love to hear your thoughts!